To prepare the stock, place all of the ingredients in a large saucepan. Cover with 3 litres of cold water, then season with a little salt. Bring to the boil over a medium heat, skimming any froth off the surface with a spoon. Cover with a lid, lower the heat and simmer slowly for 3 hours. Strain the broth through a sieve, discarding the solids, then leave it to cool. To make your soup, add a splash of oil to another large saucepan and place over a medium heat. Add all the vegetables, except the peas, and sauté for 5 minutes. Stir in the orzo, pour in the stock and bring to a boil. Lower the heat and simmer for 8–10 minutes, until the veg are cooked and orzo is soft, then stir in the peas and chicken until heated through. Season to taste. 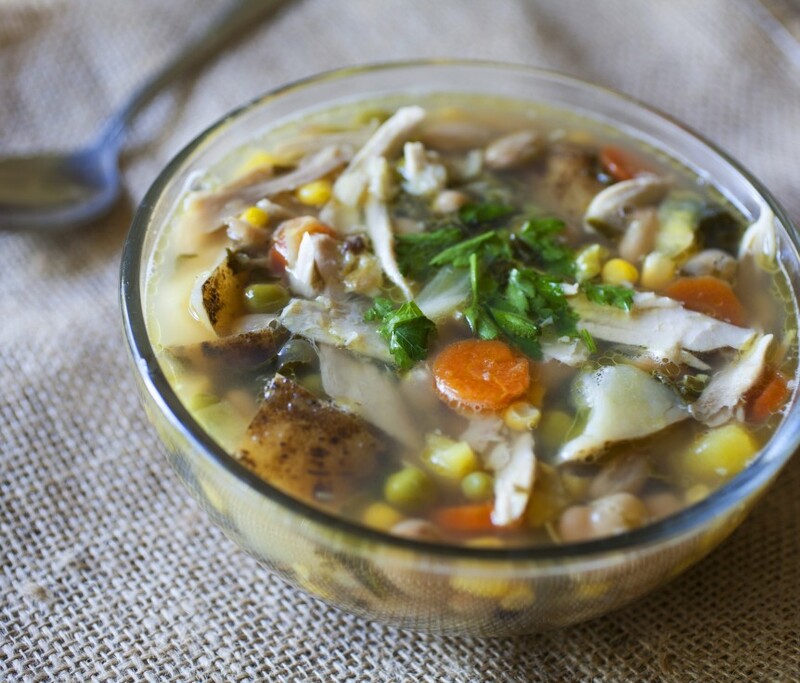 Divide the soup between bowls, top with the herbs, and serve.